On September 13, 2018, Duke’s wireless security certificate will be renewed by Duke’s IT Security Office. This is standard practice to ensure that the Duke community has the most up-to-date and secure Wi-Fi. Most Dukeblue users will not see any interruption. If you are prompted to accept the new certificate after Thursday, please do so. 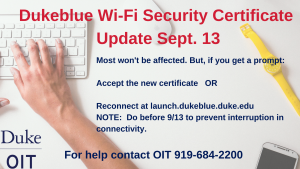 However, if your device is not centrally managed by IT staff, to ensure no interruption before September 13, download the Dukeblue profile from launch.dukeblue.duke.edu and install it on all your wireless devices. This will only take about two minutes. If you need assistance, please contact your departmental IT support person or the OIT Service Desk at 919-684-2200. Duke’s WiFi transition to “Dukeblue” is nearing completion. On August 1, we will shut down the legacy “Duke” wireless network. 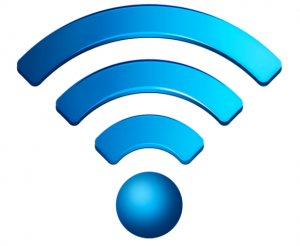 All desktops, laptops, mobile devices and tablets should be configured for “Dukeblue” wireless network by this date. Devices may easily be configured using the installer at oit.duke.edu/wireless. If you have questions or concerns, please contact the OIT Service Desk at (919) 684-2200 or oit.duke.edu/help. Duke residence halls will switch from the “Duke” network to the new secure “Dukeblue” network for fall back-to-school. Students can connect and get information at oit.duke.edu/wireless. Read the Chronicle story.